Animal bones have enthralled me since an early age. 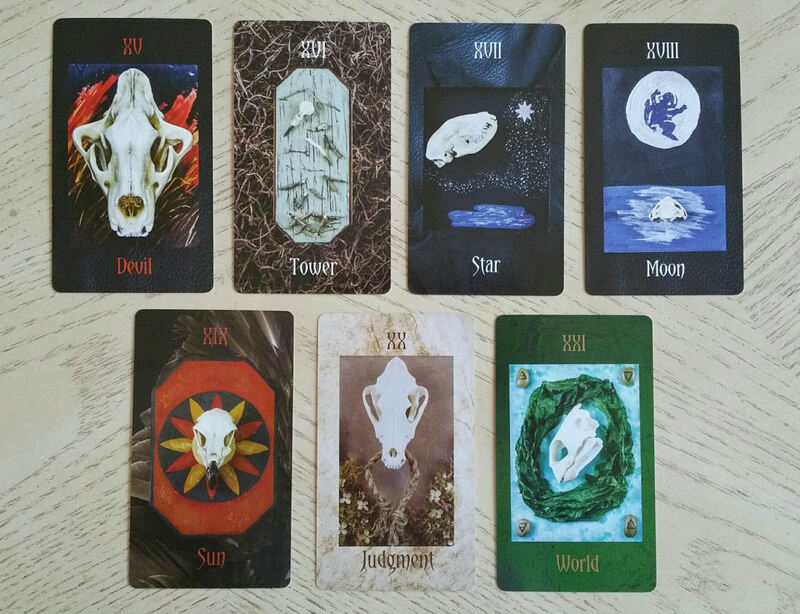 So I am excited about reviewing Lupa Greenwolf’s The Tarot of Bones and the deck’s companion book. The Tarot of Bones is a photographic portfolio of assemblage art pieces by Lupa, herself a hide and bone pagan artist. The images of a tarot deck tell stories, and through those stories, our own life story is divined. Likewise, bones tell stories, and oracle bone divination is as old as humankind. From that premise comes The Tarot of Bones. We begin with The Fool, Key 0, depicted by a coyote skull atop a field of flowers. The Magician is a corn snake skeleton formed into an ourosboros. The High Priestess is the skull of a wolf over a crescent moon formed from a mirror. On either side, an assemblage of trees. The Empress is a whitetail doe while the Emperor is the skull of a goat. I love the stories that Lupa provides in the companion guidebook. 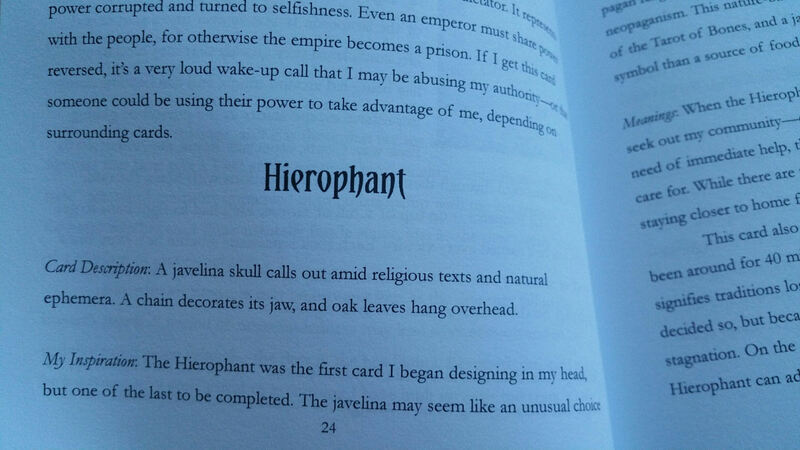 For instance, she reveals that Key V: The Hierophant was the first card in the tarot deck she started designing, but it was also the last card to be completed. Here, by the way, we see a javelina skull amid religious texts. The Lovers is a pair of albatross skulls positioned in an assemblage to represent a mating ritual. The cards are borderless on quality cardstock for easy shuffling and handling. I would consider this an art deck, since it represents an artist’s portfolio. Yet there is a cohesive theme here and the artist’s intention behind the vast majority of assemblage pieces pictured here was to create a tarot deck around bone art. So it’s also a themed deck. For The Devil, we see a lion skull and the imagery behind the skull is evocative of wildfire over grasslands. 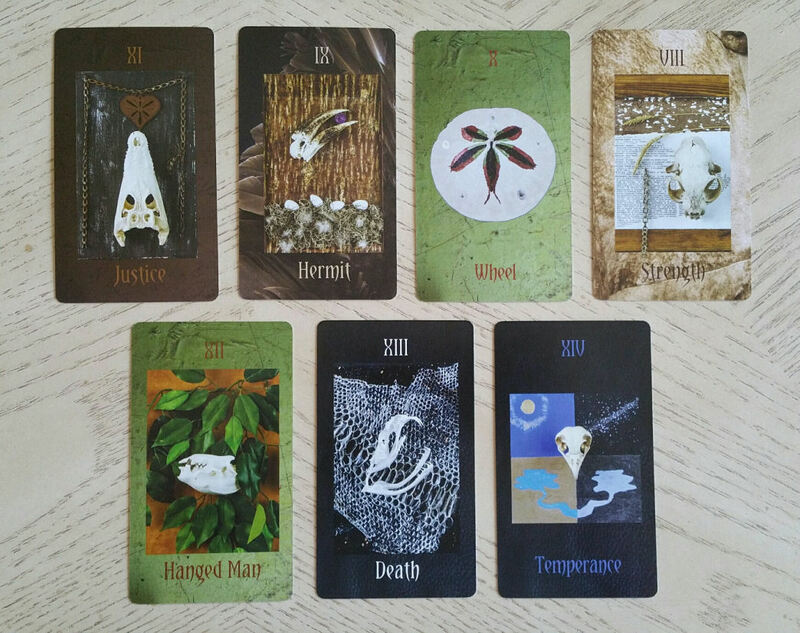 The Tarot of Bones also tells a tale of natural history through the archetypal structure of the tarot deck. In The Tower, for instance, we see the European starling skull. The European starling is considered a pest, an invasive creature that wreaks havoc on natural ecosystems. Yet it was brought to North America by humans and specifically, the starling was brought to New York by a particular human who had the hubris of believing we ought to move around flora and fauna and manipulate Mother Nature. That hubris is what created the ecosystem imbalance. And so the tale of The Tower card unfolds through the story of the European starling. I love, love, love that Lupa included a Happy Squirrel card. 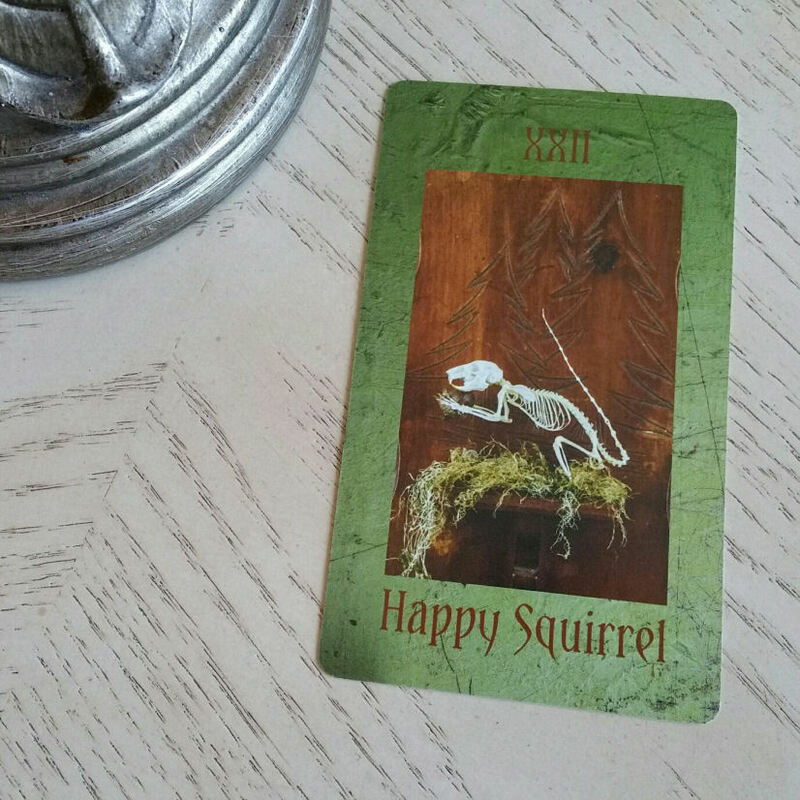 I love even more what Lupa has to say about the meaning of the Happy Squirrel card in a tarot reading. The card is about what appears initially to be senseless in fact has greater and deeper implications beyond first impressions. Something that may seem senseless in the seeker’s life is in fact synchronistic, perhaps even karmic. In the Minor Arcana suits, we start to see more flora. The connecting theme throughout the suit of Pentacles, pictured above, is deer vertebrae. But now integral to the art are also petrified wood, moss, green vines, and fruits. We find intermediate bones in the suit of Wands, such as the metacarpal bones of deer, wolf fibulae, coyote ulnas, and leg bones. The Queen of Wands is the skull of a bobcat. 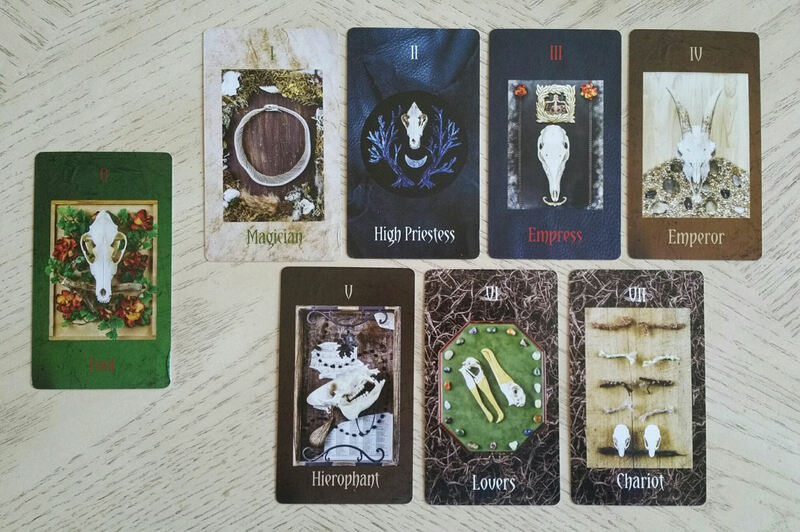 Although the color palette isn’t subdivided by suits, I love the earth tones throughout the cards, which can add color symbolism to a tarot reader’s portfolio of omens to draw from when reading with this deck. 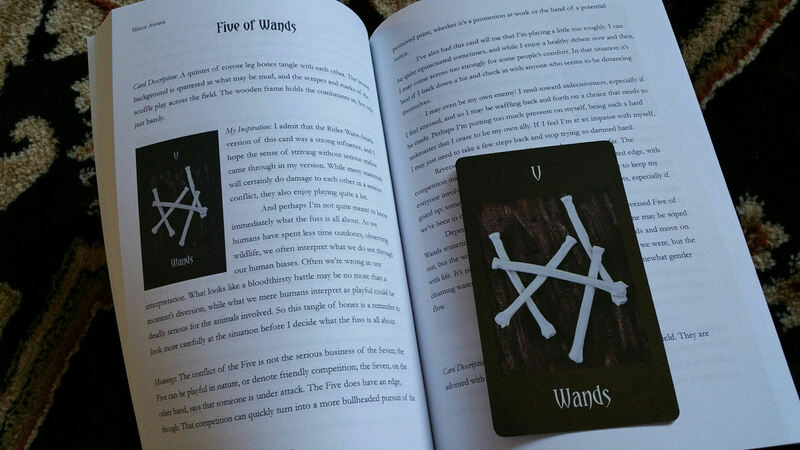 The Five of Wands is a set of five coyote leg bones entangled. The background features scuffle marks to show play and combat. It’s a delightfully creative take on the traditional Rider-Waite-Smith card meaning for the Five of Wands. The Ace of Cups is a dried lotus pod and the rib bone of a dog. In the Two of Cups, you see two python ribs that call to mind the caduceus. Rib bones unite the suit of Cups here. 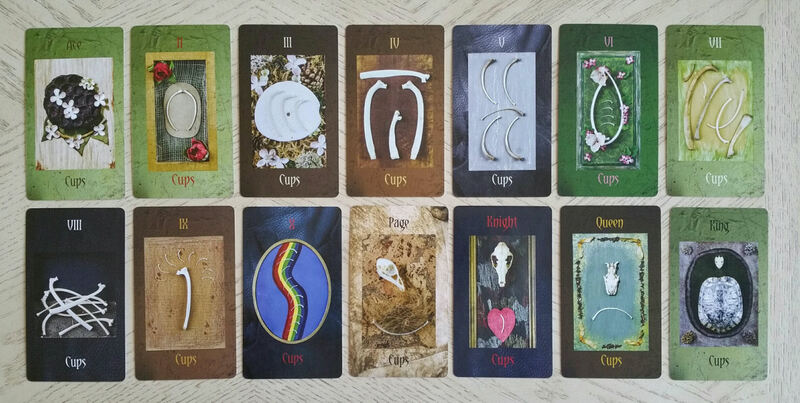 In the Ten of Cups, you have ten rib bones assembled into a ladder pattern across a rainbow. 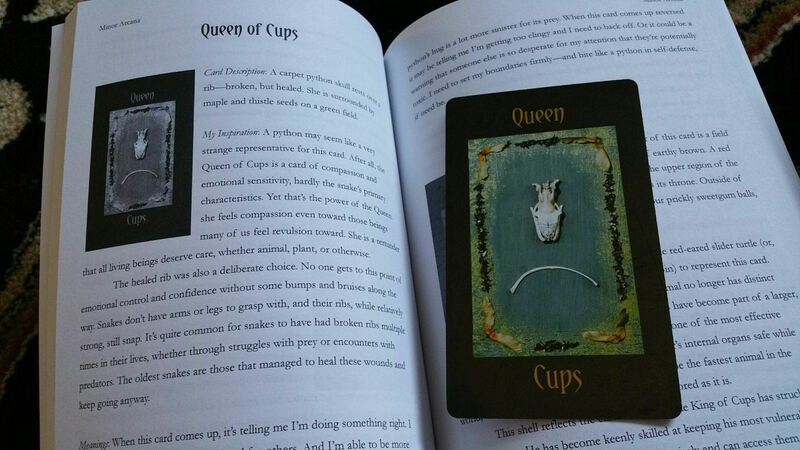 The Page of Cups is a chicken skull; the Knight of Cups, the skull of a fox. And as you read the companion guidebook, Lupa offers a wealth of insight into natural history and the artist’s point of view. 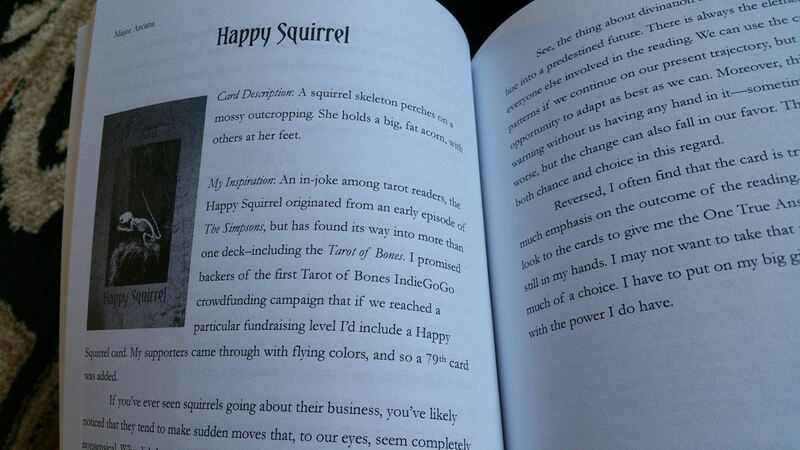 Above you get a peek inside the companion book and how well-structured it is. You’ve got an entry describing the card imagery, the artist’s inspiration for the card design, and card meaning. I resonate closely with Lupa’s interpretations of the cards throughout the book. Finally, we have the suit of Swords, united under the theme of teeth assemblage. In the Ace of Swords, for instance, we see a horse incisor, and in Two of Swords, a pair of muskrat teeth. I love the concept for the Three of Swords here– three fox fangs sunken into a red heart cast above a stormy gray and silver backdrop. Lupa tells us that the Four of Swords here is one of her favorite cards. Here is depicted four fox canine teeth encircling a piece of red agate. I love what she chose for the Queen of Swords (my significator card)–a replica of a red-tailed hawk skull amidst a backdrop reminiscent of clouds. 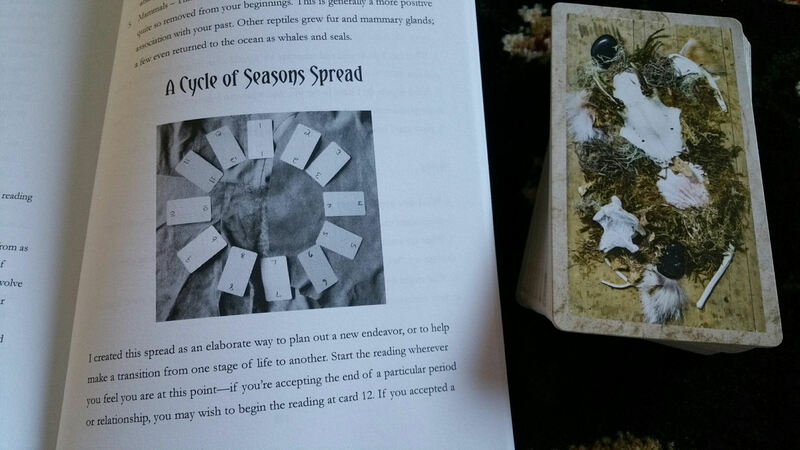 The guidebook also provides original tarot spreads to work with when using the Tarot of Bones, including a Horse Spread, Wolf Pack Spread, and Cycle of Seasons Spread, among others. 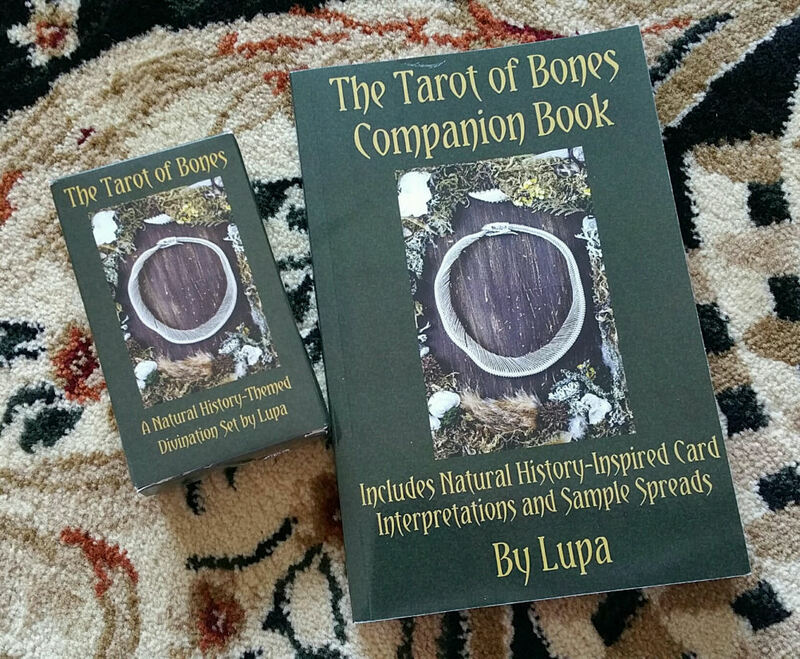 Coming in at 152 pages, the companion book is instrumental to understanding the Tarot of Bones, with so much additional wisdom and insights offered by Lupa on bones, natural history, and wildlife. 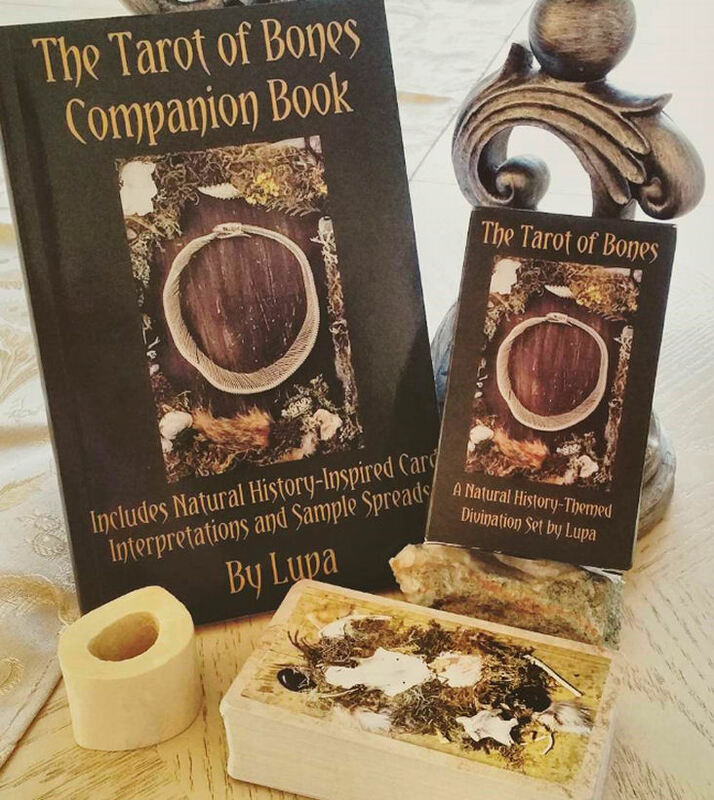 For those who work closely with bones, who collect art decks, and who appreciate tarot creations that are off the beaten path, you are going to enjoy Lupa’s The Tarot of Bones. 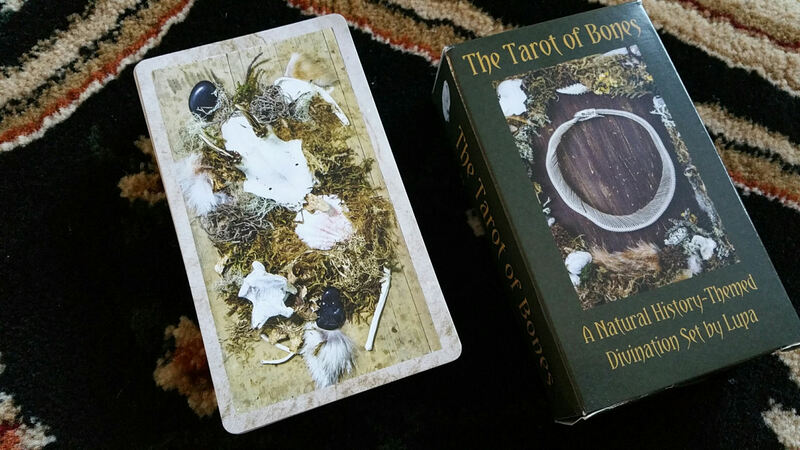 Provocative, visionary, and an approach to the tarot architecture I haven’t seen done before, The Tarot of Bones is in a class of its own. Lupa is an ecopsychologist, artist, and author living in the Pacific Northwest. Her primary area of focus is natural history and she has been a practicing pagan for over 21 years. She is also the author of Fang and Fur, Blood and Bone: A Primal Guide to Animal Magic, both published by Immanion Press/Megalithica Books, is also a Llewellyn author, and has had her assemblage bone art featured in various galleries throughout the Pacific Northwest. Read more about Lupa’s work at www.thegreenwolf.com. Photography of the assemblage bone art for the tarot deck is by Sandra Swan of Wild Hunt Photography. 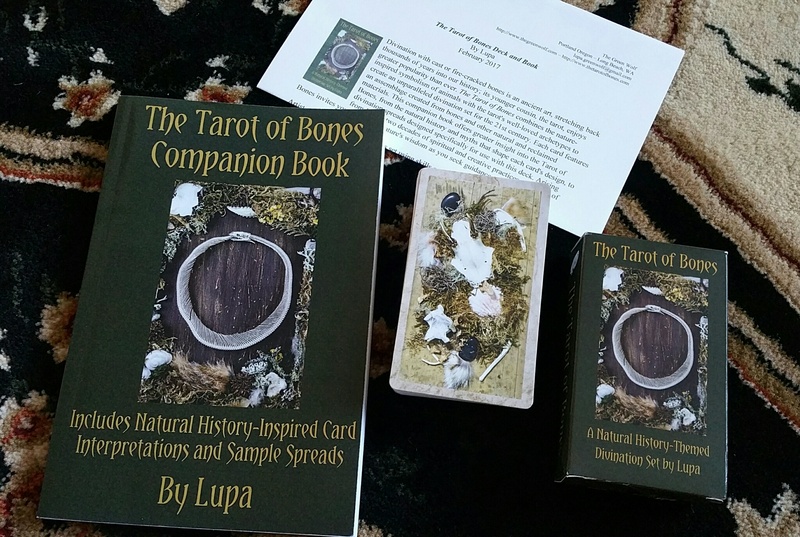 FTC Disclosure: In accordance with Title 16 of the U.S. Code of Federal Regulations Part 255, “Guides Concerning Use of Endorsements and Testimonials in Advertising,” I received Tarot of Bones from the deck creator for prospective review. Everything I’ve said here is sincere and accurately reflects my opinion of the deck and book. We hosted the Deck Debut party at the Divination Hospitality Suite at PanthenCon in 2017.